Learn about #11 and #12 on our list of Virginia’s most haunted places: the Public Gaoland the Wythe House! Jail’s ghosts include pirates, thieves, slaves, and corrupt officials. People have always been absolutely fascinated by prison culture. Just consider the success of television shows such as Prison Break, Oz, and Orange is the New Black. If you’ve watched any of their episodes, then you know how many criminals don’t believe that being locked up is reason enough to clean up their acts. They continue to plot murders, steal from others, smuggle in drugs and weapons… the sweet talkers are even able to turn guards into accomplices. It seems that when you’re confined, hatching evil plans and finding loopholes in the prison system are great ways to kill some time. Besides treachery and corruption, critics of America’s correctional system are also keen to point out other issues1: security, rehabilitation, overcrowding, and so on. So if today’s penitentiaries are so less than perfect, just imagine what life was like in acolonial prison, like Williamsburg’s infamous Public Gaol. In this two-story brick prison, located at the east end of the city, the incarcerated didn’t just wake up to austere and depressing cells. With fellow occupants including bloodthirsty pirates and traitors to the country, they were also often greeted by belligerent bunkmates itching for some conflict. When Williamsburg became the capital of the Colony of Virginia in 1699, city officials realized that with economic growth comes crime; with heightened political activity, corruption. They thus reached out to the best building contractor in the state, Henry Cary, and authorized him to construct “a strong sweet prison”2 in August 1701. Initial specifications for the gaol kept things small and simple, because it was not intended to house murderers, thieves, and other dangerous miscreants. The exercise yard at the Public Gaol. Inside a debtor’s cell at the Public Gaol. One could argue that such being placed in such an inhumane environment is a befitting punishment for evil pirates, especially if they served under the infamous Blackbeard. 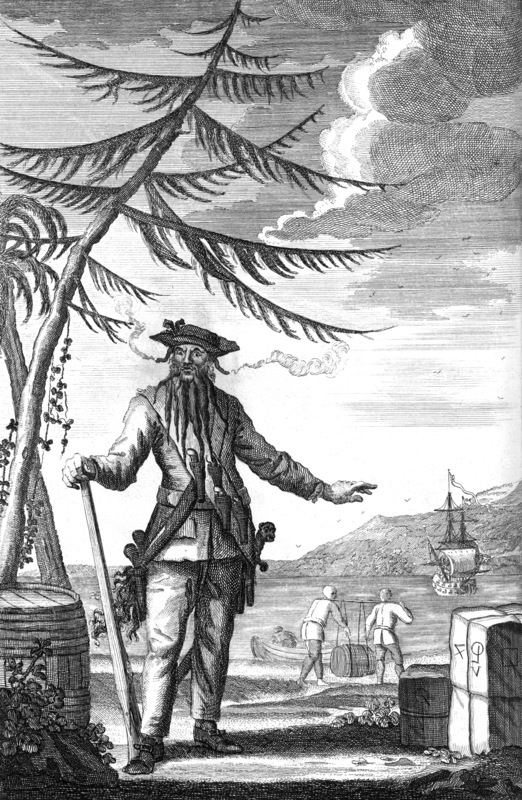 An engraving of the pirate Blackbeard. Image Source: Early American Crime. Before Edward Teach earned the title of Blackbeard and a reputation for terrorizing the seas, he was just a humble sailor. But things changed once he joined Benjamin Hornigold’s Flying Gang of pirates; he quickly learned the ways of the corsair and became one of the most feared pirates to roam colonial coastlines. Capture of the Pirate, Blackbeard, 1718 by Jean Leon Gerome Ferris (1920). Another one of the gaol’s most famous occupants was Governor Henry Hamilton. Hamilton’s ability to forge friendships with Indian chiefs had earned him two nicknames (which he detested): the “Scalptaker” and the “Hair-buyer General.” There were rumors of Hamilton purchasing the scalps of dead settlers from Native American raid parties, so he was captured by Colonel George Rogers Clark in 1779 to face these allegations. As he awaited trial, the poor Governor discovered that even political prominence does not exempt one from brutal treatment at the Public Gaol. He was barred from pen and paper, shackled in a tiny cell with six other criminals, and forced to eat disgusting prison food. The surrender of Governor Henry Hamilton to Colonel George Rogers Clark on February 24, 1779. If this isn’t enough proof of injustice, consider the fact that many prisoners belonged in a hospital, not a jail! In fact, it was only in 1773 that Williamsburg saw its first public hospital open. Before colonists realized that there is a huge difference between lawbreakers and “lunaticks,” the mentally ill bunked with convicts. The jail also had a substantial female population; the ghosts of two women are rumored to still lurk in the gaoler’s upstairs quarters. Enter the Public Gaol… if you dare! Step into the world of pirates, murderers, traitors, and the mentally insane! Aleem, Zeeshan. “8 Jarring Facts That Every American Needs to Know About Our Prison System.” Policy.Mic. Mic Network Inc. 20 February 2015. Web. 14 August 2015. Tyler, Lyon Gardiner. Williamsburg, the Old Colonial Capital. Richmond: Whittet & Shepperson. 1907. Page 221. The John Hopkins University Press. Architecture and Town Planning in Colonial North America, Volume 1. Baltimore: The John Hopkins University Press. 2002. Page 591. Erickson, Mark St. John. “The gallows where Blackbeard’s crew swung.” Daily Press. 26 May 2012. Web. 14 August 2015. Para. 3. Hart, Priscilla. “The Madhouse of Colonial Williamsburg: An Interview with Shomer Zwelling.”History News Network. 5 October 2009. Web. 14 August 2015. Para. 11. Hauck, Dennis William. Haunted Places: The National Directory: Ghostly Abodes, Sacred Sites, UFO Landings, and Other Supernatural Locations. London: Penguin. 2002. Page 441. 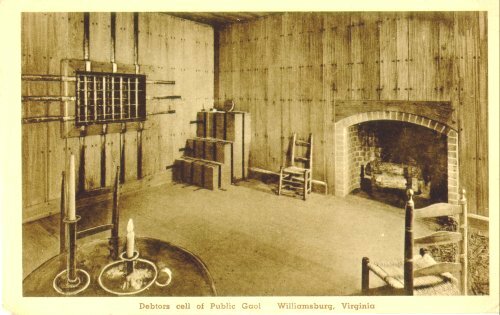 “Public Gaol (Williamsburg Jail) Ghosts.” Colonial Ghosts. Colonial Ghosts, 2015. Web. 14 August 2014. Para. 5. A murdered judge, a heartbroken wife, even George Washington himself – mansion’s ghosts love to appear at midnight. The Wythe House, exterior facade. To quote Edgar Allen Poe, “the hour of midnight to one belongs to the dead.” That’s why many paranormal investigators believe that 12 AM is the best time to do some ghost hunting, to make contact with those who are not of this world. The theory isn’t new; flip the calendar back to 1935, and you’ll find Reverend Dr. W.A.R. Goodwin, clergyman and avid ghost believer, settled in the infamous Wythe House a few minutes before the witching hour. Who are some of these “gladsome companions” Goodwin hoped to encounter? Some claim that up to four ghosts haunt the mansion: Judge George Wythe, the house’s second owner; Lady Ann Skipwirth, a frequent guest to the house; Governor John Page, a later tenant; and George Washington himself, who lodged at the house during the Revolutionary War. The property is located on the west side of the Palace Green, Williamsburg, where its exterior façade of scarlet brick and white woodwork make the perfect backdrop for tourist photos. Besides the luxurious mansion, the estate includes a smokehouse, a lumber outbuilding, a stable, and a chicken pen. Visitors can stroll through the hedges of its well landscaped gardens and imagine Taliaferro proudly surveying his impressive creation. The Wythe House has two stories, each containing four rooms. Its bricks were carefully laid in both Flemish bond, a pattern of masonry Taliaferro would also favor when he contributed to the design of the Governor’s Palace. Thus, though smaller in size, the Wythe House mirrors the grandeur and opulence of a dwelling reserved only for Virginia’s Royal Governors. Plans for the Wythe House. To be sure, George Wythe, who lived in the house from 1755 to 1791, was also a man of colonial stardom. Wythe’s insatiable appetite for knowledge and diligence as a law student allowed him to pave an exceptional career in politics and legislature. He became the first of many things: the nation’s first law professor, and the first Virginian to sign the Declaration of Independence. Thus, after Wythe’s first wife, Ann Lewis, passed away in 1748, he found new love quite easily: Taliaferro’s daughter, Elizabeth. In his will, the Taliaferro bestowed the newlyweds with life tenancy at the estate he’d so exceptionally designed. But after spending over thirty happy years at the Wythe House, Elizabeth was struck by illness. After several months of prolonged suffering, she finally passed away on August 14, 1787. Widowed and childless, George Wythe was probably more than happy to relocate to Richmond in 1791, the year he was accepted as a judge of Virginia’s Court of Chancery. Unfortunately, tragedy followed him to there as well: he was murdered by his George Wythe Sweeney, the next in line to inherit the Wythe estate. George Wythe Sweeney was the polar opposite of his esteemed great uncle. A cocky young man with a serious gambling addiction, Sweeney was always plotting ways to deal with his rising debt problem. Stealing from Wythe and forging the judge’s name was two of his favorite methods. When even these could no longer save him from financial ruin, Sweeney decided to go to the extreme; in 1805, under the pretense of being concerned for his aging great uncle’s wellbeing, he moved into Wythe’s Richmond home and began to plan a means to obtain his inheritance quicker. A vintage bottle of arsenic – perhaps similar to the one used by Sweeney! Though Wythe was not murdered at the Wythe House, his spirit is believed to still visit the mansion, perhaps to be reunited with his beloved second wife. Some who have spent the night in his old bedroom, for example, recall the disturbing sense of cold hands resting on their foreheads. Was it the spirit of a slave who moved the candle? Or perhaps it was the ghost of Lady Ann Skipwirth, who lies buried in the Bruton Parish Churchyard nearby. The Wythe House has its own haunted “Cinderella” story! Of all the ghosts rumored to reside within the Wythe House, Lady Skipwirth’s is the most frequently encountered. When the Wythe couple hosted a gala at their mansion in 1780, Lady Ann Skipwirth and her husband, the wealthy planter Peyton Skipwirth, were on the guest list. At one point in the evening, the Skipwirths had a violent altercation; a well-known womanizer, some blame Peyton’s wandering eye (which often fell on Lady Ann’s sister, Jean!) In true Cinderella fashion, Lady Ann stormed out of the ballroom and fled upstairs just before the clock struck midnight, losing one of her beautiful red slippers in the process. In a fit of jealous rage, it’s believed that she took her own life in one of the mansion’s bedrooms. Many investigators believe that Lady Ann is the spirit behind most of the house’s paranormal activity: the strong scent of lavender perfume lingering in the halls, the echoes of heels clicking on the stairs, etc. Some visitors have even seen the Lady, still decked in her finest gala garb, materialize then disappear through the house’s walls. Hume, Ivor Noël. Something from the Cellar: More of This & That: Selected Essays from the Colonial Williamsburg Journal. Williamsburg: The Colonial Williamsburg Foundation, 2005. Page 94. “Powhatan.” National Register of Historic Places Inventory – Nomination Form. United States Department of the Interior, National Park Service. 15 September 1970. Web. 18 August 2015. Page 3. “The Wythe House.” National Register of Historic Places Inventory – Nomination Form. United States Department of the Interior, National Park Service. 9 October 1974. Web. 18 August 2015. Page 3. “The Murder of George Wythe.” Colonial Ghosts. Colonial Ghosts, 2015. Web. 19 August 2015. Para. 5. Hume, Ivor Noël. Something from the Cellar: More of This & That: Selected Essays from the Colonial Williamsburg Journal. Williamsburg: The Colonial Williamsburg Foundation, 2005. Page 97.